Welcome to the first edition of “By the Numbers”, a series of interviews that I will post whenever I can find real writers willing (and by willing I mean succumbing to an ever-increasing barrage of e-mails from me asking/begging them to participate) to answer a few ridiculous questions from yours truly. While I’ve kicked around the idea of doing interviews with writers for a long while now I’ve always been hesitant to move forward with it. It wasn’t that I was afraid of being a bad interviewer (I’m sure that I’m a bad interviewer), nor from fear of being rejected by actual writers (I have a long history with rejection) that made me hesitate to begin this series. No, my hesitation instead stemmed from introducing you all to people who actually write well and, thereby, showing you what you are missing when reading my blog instead of something good. Selfish? Not at all. I did it solely for self-serving reasons. In all seriousness though, I’ve read a lot of good blogs since I started my own and I like the idea of spreading the word about these talented bloggers, authors or accountants who feel the need to write in order to balance out the over-abundance of numbers in their heads. With that said, it is with great pleasure that I get to introduce you all to a talented actor, soon-to-be-published author of her Young Adult novel “The Tethering”, and fellow blogger: Megan Orlowski-Russell. Before we get started I’d like to thank you for agreeing to do this interview. Has the honor of being the first person to be featured in my new interview series truly sunk in yet? Please be honest. I think it has. Anyone who reads my blog lifebeyondexaggeration.com and actually thinks I am cool enough to be on their blog has graced me with a great honor. Or has lost their mind. Either is possible. In my case it’s most likely the latter which leads me to my next question: What was your name again? That one’s complicated. On lifebeyondexaggeration.com it’s Megan Orlowski-Russell, but since no one can spell Orlowski, The Tethering will be published under Megan O’Russell. I’m glad you mentioned The Tethering. For those that may not know, this will be your first book to be published, so congratulations on that great achievement! The one question that most of my readers will be wondering is whether any accountants will be featured in The Tethering? The Tethering is a young adult fantasy novel featuring a lot of magic and a fair number of disastrous occurrences, but there are no accountants. This interview wouldn’t have been possible if I hadn’t promised that every person that read this post would buy “The Tethering”, so I would appreciate it if you did your part in holding up my end of the bargain. No accountants huh? Well, can you tell us what your book is about anyway and when it will be released? Where will people (or accountants) be able to purchase “The Tethering”? The e-book will be available for Kindle users September 18th, and the print version will be out the next month. The book will also become available for Nook at some point, but I don’t have an exact date on that. SilenceintheLibraryPublishing.com will have all the versions for sale as they become available, and my author website, meganorussell.com, will have updates as well. As a writer who has written several successful books in his mind I know how difficult and frustrating the writing process can be, do you have any words of advice for people who are thinking about actually writing a book? If you have characters or a story in your head and you want to write it down, do it. It doesn’t matter if it’s in order. It doesn’t matter if it’s good. Just sit down and write. Either you will keep sitting down to write because there is more of your story that needs to come out, or you won’t. And either is okay. But you’ll never know if there is more to the story until you get that first page out. Editing a book is way worse than writing one, but you can suppress the notion of editing horror until you’re ready for that phase. If you want to be published, slash your soul in two and edit. If you just needed the outlet, then you finished a book, and that in and of itself is a major accomplishment. 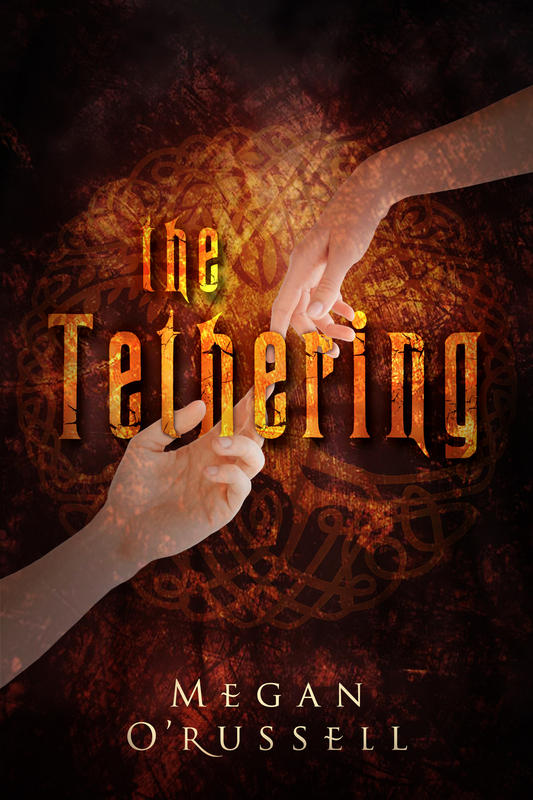 What have you most enjoyed about writing “The Tethering”? Getting to know the characters better. Finding Easter Eggs that I didn’t even know I had left for myself. And creating a world that I can play in. Besides myself who do you draw inspiration from in regards to your writing? Not one person in particular. Most of my characters are a little bit of this person with another bit of someone else. Honestly my husband is usually the one to go “Oh, that character is our friend (insert name here),” and he usually ends up being right even if that wasn’t the intention I began with. Has the honor of being the first person to be featured in my new interview series sunk in yet? You can be honest if you wish. Besides being a soon-to-be-published-author, what else can you tell us about yourself? Well, I’m an actor who travels the country for work. Right now I’m in Denali, Alaska, but I’ve been all over. I love my ukulele named Lil’ Chip, I’m obsessed with Pluto (the Disney Dog, not the stupid proto planet), and I hate eggplant. I’ve never played an accountant, but I have played a secretary several times. I can pretend to type on an old-fashioned typewriter like the professional I am. If you can arrange to switch out your computer for a typewriter, I may be able to fool people for one song (three minutes) if you would like an extra coffee break. I’ll get our IT person on it and let you know when the typewriter is in place. In the meantime, since we are on the subject of acting, if you could choose to live your life within any movie (or play) what movie (or play) would you choose and why? I want to say the old BBC Narnia movies, but I don’t think I would survive past the first battle scene. So maybe I should just live in a musical comedy. I think it would work better with my skill set. My son recently asked me what I was doing on the computer and, after I told him that I was typing up interview questions for my blog, he asked if he could ask a question as well. So, my oldest son would like to know if you are a fan of the game Plants Vs Zombies and, if so, do you think that chomper plants would be able to defeat the engineer zombies in a battle? I have never played Plants Vs Zombies, mostly because I feel that in a true zombie apocalypse I would prefer a crossbow to a plant. If I am going to prepare for the zombies, I wish to do it in as practical a way as possible. Now that we have covered your knowledge of video games, I have two last questions. First, if you were given a chance to do it all over again, would you still have agreed to do this interview? Please explain. Absolutely! First, your questions (and your son’s) are great, and second, I could never turn down such a prestigious interview. Finally, being the first person chosen for my new interview series is, I imagine, quite an honor for you. Has this honor sunk in yet? In no way should you be honest while answering this question. I don’t think I will ever truly comprehend the honor you have bestowed upon me. But I will cherish this memory and time on your blog.